I revised this English edition with the help of Richard St Clair (Shaku Egen) and added some footnotes marked with "editor's note". The pdf is also of a better quality. I am glad to present to you this English edition of Ojoyoshu, composed in 985 by Master Genshin (Eishin/Eshin), the sixth Patriarh of our Jodo Shinshu school. It contains only two chapters from the entire work, but still I am sure you will find it useful. The importance of this text upon Shinran Shonin and Honen Shonin was great, the first even wrote a commentary on it, Notes on Essentials of Rebirth, while the latter wrote four such commentaries. 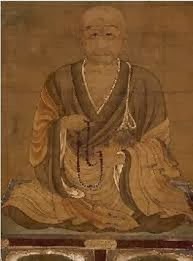 In 986, a copy was sent to China, where the monks where so impressed that they called Genshin the "Little Shakyamuni". I have been looking for a translation of this text but I could hardly find a recent one. So after long search I came by a magazine called The Transactions of the Asiatic Society of Japan, second series, volume VII, 1930. In it there was this translation from Japanese made by A.K. Reischauer ( M.A., D.D., L.L.D.) which I decided to share with you here.